Our mission at Christmas Tree Market is to make your Christmas decoration dreams come true—for less! We offer a wide selection of artificial Christmas trees—even white artificial Christmas trees and lighted palm trees—and each one is priced to sell. Even though we are offering bargains, quality is king at Christmas Tree Market. 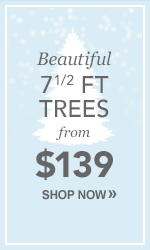 Our artificial trees have hinged branches and a compact, lightweight tree stand to take the hassle out of holiday setup. We want to make artificial trees fun for the whole family by providing quality, safe, pre-lit trees with strong branches perfect for Christmas decorations, and enough variety to fit everybody’s style. Another way we simplify shopping for Christmas decorations is to offer everything you need—from traditional artificial Christmas trees to pristine white Christmas trees to lighted palm trees, not to mention Christmas wreaths, garlands, and other Christmas decorations, in one place. Get your whole house ready for the holidays with one order from Christmas Tree Market—you will still have room in your budget for the gifts! Copyright © www.christmastreemarket.com. AllRights Reserved. *Free shipping for continental U.S. only.